This has to be one of the tastiest Contests ever! Not Quite Nigella is hosting a Chocolate Cake bake off…. YUM!!! You’ll need to get baking your best ever chocolate cake and take some great photos to show it off……. Do that and you could be in the running to win 3 ballotine boxes of their best truffles worth $25 each!! Head over here to Not Quite Nigella for the full terms and entry details. Head over to Entrepgirl’s blog to share in the celebration’s for her 100th Blog Post!! She’s giving away Entrecard points which wills ure come in handy for entrecard members! This is my 100th post!!! I’m grateful to be still blogging after five months, it’s not really easy to attend to this with all the work and chores I have to do each day. Still, this has become sort of a stress release for me and so I go on. I’ll be having a contest. I will be giving EC credits to the winner (as soon as I know how to do that - anybody who wants to teach me just how to is most welcome). The contest will end on November 30, 2008. Note: Winners will be picked via the electronic online raffle in Random.Org. The entries are per blog site so a blog owner with several blogs can possibly win more than once if they’ve written about my contest and favorite post link in more than one blog. Jen at Semantically Driven is currently running a really amazing competition giving you the chance to win a mobile phone! I’m sure there are plenty of Aussie Bloggers out there who could use a new mobile phone, so definately be sure to check out Jen’s Blog before October 31 to get your entry in! Write about why you would like to win it on your blog. It doesn’t have to be a long entry. Make it funny, add pictures. Do what you like, so long as it conveys why you want this phone. Link to my blog - http://semanticallydriven.com within your entry. Stuart over at Secluded Habitat, a great Australian Blog is offering A year’s free Blog Hosting for a lucky Entrecard participant. So, if you are part of the Entrecard program and would love some free hosting for your blog then head on over to Secluded Habitat. Stuart has the contest guidelines and entry details set out ready for you to get started. Basically you can win one of FIVE prizes which include a minimum of a year’s blog hosting and more. The competition entries will close at 11:59 PM Australian Eastern Daylight Savings Time on October 26, 2008. Winners will be decided and released on this blog by 11:59 PM AEDST on November 9, 2008 at the latest (its Uni exam time around then, that’s why a couple of weeks are needed). Then head over to the blog to leave your details on this blog competition thread. Want to know what I think a Simple Married Life is? Sometimes smiles and sometimes frowns. Sunshine or Rain, we’re in it forever. But our kiddies one, two, three. Polka Dot Bride has a real treat in store for anyone planning a wedding! If you’ve ever planned a wedding or event, then you know just how difficult and frustrating it can be to organise seating lay outs. Polka Dot Bride has you covered with an amazing competition to give away 3 lots of “Perfect Table” Software. Head on over to the Chocolistas where they are hosting this yummy blog contest. It is open for both worldwide entrants (First Prize) and U.S. Entrants only (second prize). 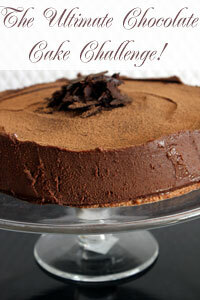 The contest is lots of great fun too, put your imagination to use and name the featured chocolate dessert… YUMMO……. Being so obsessed with entering competitions and contests means that I have a pretty sharp eye when it comes to spotting them. About a year ago I noticed the growth of blog contests and competitions. Of course, there is a huge blogging following through the U.S. so many of these blog contests are not open to Aussies. At first I was going to put up a new domain all together, and I still might, it will depend on the interest of Aussie bloggers to run competitions and have them listed here, chances are when I find great competitions I will be putting them up on here anyway. So my idea is to have a specific area for Australian Blog Competitions, and of course a section for U.S. Blog Contests that are running also so as to spread the love around……. I’m a Top 100 Australian Women Blogger!! !